Our bagels are made fresh, from scratch almost every day. 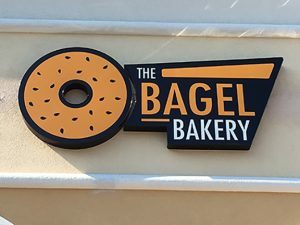 You won’t find a fresher bagel in Gainesville. The variety – our options are endless. With over 15 bagel flavors, we have a bagel to suit every palate. We even have a cream cheese to suit your mood, from strawberry to spinach and artichoke. Don’t forget about our Bag O Bagels. For $17.79, you can bring home thirteen bagels and two 8 oz. tubs of cream cheese. It’s hosting made easy. Our coffee isn’t any ordinary joe. It’s micro-roasted, organic, direct-trade and most importantly, flavorful. Last but not least, our customers. 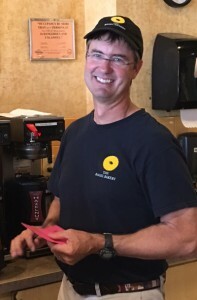 You all make the Bagel Bakery the fun, warm and inviting place it is. 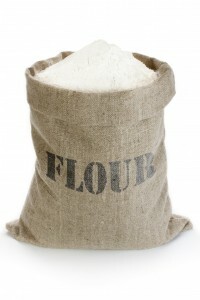 Every week, we get our weekly delivery of 1,500 pounds of flour. Our products go from flour to your mouth in about a day. It’s not always easy, but our real, boiled bagels don’t go unnoticed. Recently, a woman with a European accent said she was taking half a dozen bagels to Norway. Later in the afternoon, I received a compliment from another customer. “Your bagels are just better than New York Bagels,” she said. These compliments encourage our creaky backs as we continue through the last 500 pounds of flour. 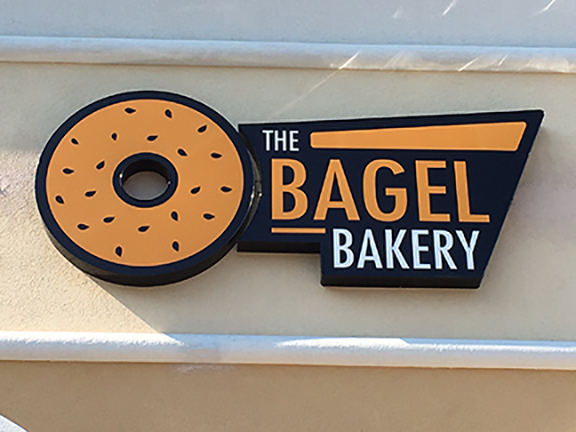 At the Bagel Bakery, we don’t make our bagels the easiest way; we make them the best way. We don’t mind the extra effort when we see our delighted customers. With Halloween behind us, many believe it’s socially acceptable to start thinking about Christmas. 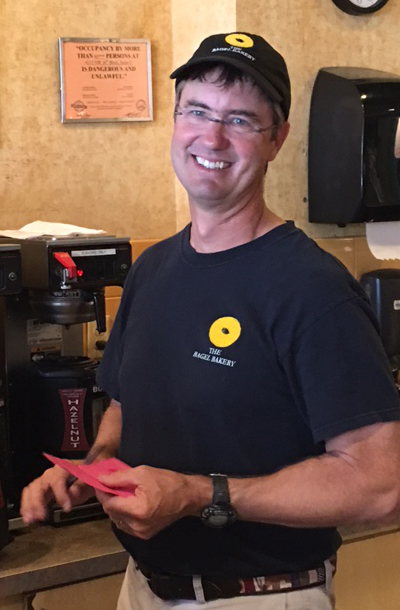 Our owner Ken makes every week Christmas for those who receive his weekly bagel orders. Friday mornings, you may see Ken driving fast in his blue FJ Cruiser “sleigh” full of bagels. Santa Ken makes his rounds to Phi Mu, Tau Epsilon Phi, Chi Omega and SumTotal, delivering his fresh, delicious bagels. Call the Bagel Bakery to place your order.